We, Ganpati Textiles, established in the year 2013, are among the leading manufacturer, traders, suppliers, wholesalers of a wide range of Ladies Apparels. The product range offered by is inclusive of Anarkali Suit, Heavy Party Wear Suits and Ladies Heavy Designer Suits. These ladies apparels are valued for their trendy design, attractive appearance, impeccable finish, colorfastness and resistance to shrinkage. In addition to this, these ladies apparels are designed from quality assured fabric yarns and in compliance with the prevailing fashion trends at the vendors’ end. 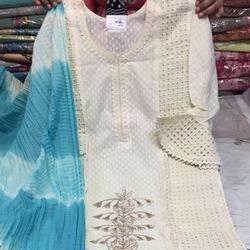 The offered suits and apparels are available with us in various sizes, patterns, color and designs. We have been backed and supported by a team of skilled designers and craftsmen that work in close coordination with each other to avoid any hassles in the workplace. Hold expertise in their area of operation, our designers are trained through workshops and seminars at regular intervals of time. This training conducted by experts, enhances and polishes the skills of our professionals in the most efficient manner.